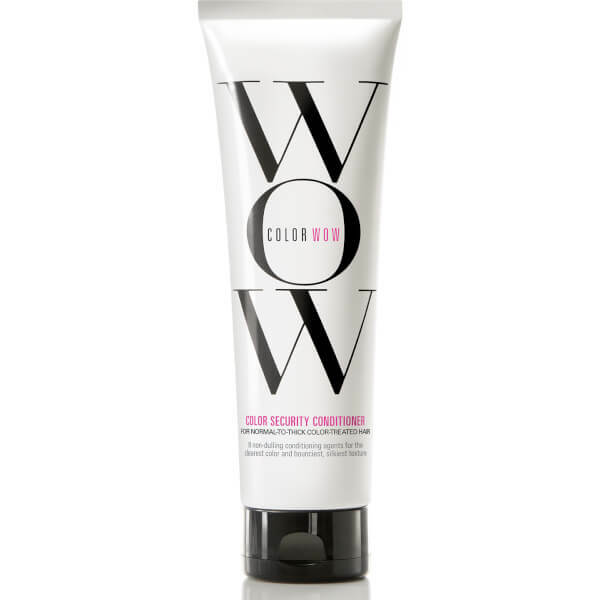 Catering for normal to thick, colour-treated hair, the Color WOW Color Security Conditioner works to hydrate, soften and maintain vibrancy. Powered by a colour-shielding Sealicon™ Complex, the weightless formula delivers a protective coating around individual hair fibres to defend against dullness and dryness, whilst innovative Aquamino Emulsion Technology™ detangles and improves manageability. Expect radiant, healthy locks from root to tip. Aqua (Water), Cetearyl Alcohol, Cetyl Alcohol, Stearamidopropyl Dimethylamine, Cyclopentasiloxane, Ppg-3 Benzyl Ether Myristate, Behentrimonium Chloride, Amodimethicone, Glycerin, C18-21 Alkane, Parfum (Fragrance), Persea Gratissima (Avocado) Oil, Citric Acid, C13-16 Isoparaffin, Isopropyl Alcohol, Dimethiconol, Panthenol, Dmdm Hydantoin, Propylene Glycol, Guar Hydroxypropyltrimonium Chloride, Ceteareth-20, Quaternium-95, Hydrolyzed Keratin, Cetrimonium Chloride, Disodium Edta, Trideceth-12, Polyquaternium-7, Linalool, Propanediol, Butylene Glycol, Butylphenyl Methylpropional, Hexyl Cinnamal, Limonene, Iodopropynyl Butylcarbamate, Sodium Benzoate, Potassium Sorbate, Hydrolyzed Silk, Potassium Benzoate, Phenoxyethanol, Imidazolidinyl Urea, Pentaerythrityl Tetra-Di-T-Butyl Hydroxyhydrocinnamate, Sodium Methylparaben.